Mining Operations: Mining Outline, Interactive Mind Map. Elearning. To link: click a red arrow. To see a note: Hover over a yellow note button. To Fold/Unfold: click a branch. To Pan: click and drag the map canvas. 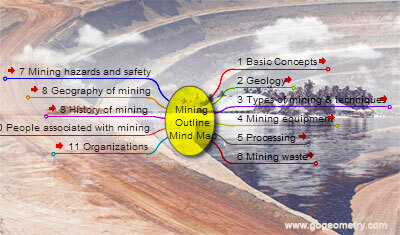 This mind map or mindmap is an image-centered diagram that represents connections between various topics and concepts related to mining. Source: Wikipedia: Outline of Mining.